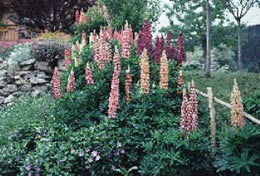 This 100% pure seed Lupine Collection will accent your landscape with blue gold, red, and rose spikes of color. Perennial Lupines are easy to grow and will reward you with years of enjoyment. Ideal for borders barrels, and around mail boxes. Gorgeous spring blooms within 3-4 months of a fall planting. 1-2 feet tall.